The first CSI5* class of the Shanghai Longines Global Champions Tour kicked off in style with a blazing win from Marlon Zanotelli (BRA) and Extra van Essene - the consistently speedy pair always one to watch when time is of the essence. Second went to Belgian star Constant van Paesschen (BEL) and third to Ireland’s Cameron Hanley (IRL). 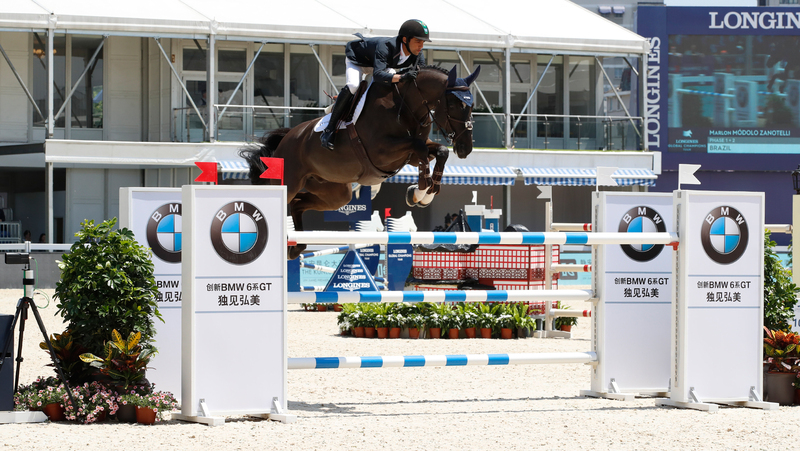 The opening day of the three day show jumping extravaganza in the Shanghai Pudong District set up the weekend’s event nicely, with the most Eastern stop on the 17 event Championship a ground-breaking development in the development of the sport in Asia. Every year, more and more spectators gather to watch show jumping like never before seen in China, and today was no exception as fans queued at the gate, waiting patiently to enter the show ground where a stunning shopping village and entertainment area - with a European style feel - welcome guests of all ages. 48 international superstars would take to the arena in the first CSI5* class of the event, with 25,000 euros on offer to the victors. Under clear blue skies, the best horses and riders in the world flexed their muscles for the first showdown, a two phase 1.45m class, with the enthusiastic crowd gasping and cheering at every clear, breathless with their appreciation of the stunning horses competing at the top of their game. Uliano Vezzani’s course was a welcome introduction into the Shanghai Longines Global Champions Tour weekend, with plenty of jumping still to come, however featured a tricky treble set against the long side of the VIP hospitality and a spooky looking wall and gappy liverpool followed in quick succession. First to go, and first to go clear was Marc Houtzager (NED) with Sterrehof’s Edinus who put in a blinding round to dazzle the crowd and set the bar for the rest of the field to come. Despite being the opening class of the weekend, many of the world’s best put the pedal to the medal to be in with a chance of winning the lion’s share of the prize money. Constant van Paesschen (BEL) with Compadre van de Helle soon bettered that bench mark, smashing the time in 21.22s and the young Belgian rider who makes his return to Tour visibly delighted as they exited the arena. But his lead was not long held, as speed merchant Marlon Zanotelli (BRA) with Extra van Essene pulled a phenomenal round out of the hat, stopping the clock at 20.45s. An unlucky refusal for Scott Brash (GBR) and the young 9 year old gelding Hello Mr President in the second half of the two phase drew gasps from the crowd, as did a double refusal for Mathilda Karlsson (SWE) at the spooky looking wall. There was disappointment for local fans after Raena Leung (HKG) and Orphee du Granit crashed through a purple and white oxer, ruling them out of contention for a top placing today. But clears came thick and fast with Shane Breen (IRL) and CSF Vendi Cruz, Ben Maher (GBR) with Madame X, Michael Whitaker (GBR) with Valmy de la Lande, Jerome Guery (BEL) with Celvin, Cameron Hanley (IRL) with Aiyetoro, Christian Ahlmann (GER) with Clintrexo Z, Lorenzo de Luca (ITA) with Jeunesse van T Paradijs, Christian Kukuk (GER) with Lacasino, Romain Duguet (FRA) with Calder, Maikel van der Vleuten (NED) with Utopia and Wout-Jan van der Schans (NED) with D’Angelo. But it was Marlon Zanotelli (BRA) who left the field in his wake, claiming the first win of the weekend. The second class will be Round 1 of the GCL Shanghai team competition, kicking off at 15:00 local time. Tune in via GC TV to watch all the action live!